Steven Heighton’s prose piece “The Age of Clowns” is the first item in this issue. It is an unusual and interesting blend of story and essay, part autobiography and part cultural criticism. The piece follows the author as he embarks on a footrace against costumed opponents, and as he reflects on the state of contemporary thought. “The Age of Clowns” is followed by Patricia Young’s short poem “Days of Summer,” and these two pieces set a precedent of literary quality met by the rest of the issue. This issue also contains a translation of Austrian author Barbara Frischmuth’s short story “Witch of the Wildwood.” Gerald Chapple and James B. Lawson’s translation of Frischmuth’s story is exciting, as it is a translation of a still-living author with few works translated to English. “Witch of the Wildwood” is set in the Austrian countryside and the story takes a dark twist on fairy tale and romance genres, with the exact time period in which it takes place left uncertain by the narration. And be sure not to miss “adios piazzola,” a short story by Chilean-Canadian writer Carmen Rodríguez. At less than three pages long, “adios piazzola” is very short, but contains a lot of story and emotion condensed into vignettes—a Chilean expatriate tries twice and fails to see the famous musician Astor Piazzolla. The story is told against the political backdrop of Pinochet’s military regime in Chile. Also in this issue is an interview by Eleanor Wachtel with Jeannette Winterson. The two mainly discuss Winterson’s fiction, with some interesting topics such as the nature of language. Winterson’s responses to Wachtel reveal the wide scope of her knowledge and reading on various subjects—for example she mentions Chaucer, Woolf, and Robert Graves as her current reading list—making the interview enjoyable reading even for those who don’t know Winterson’s work. 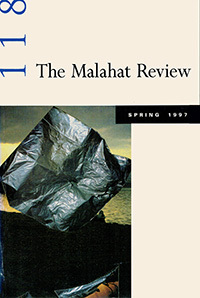 Near the end of the issue is a review of Timothy Findley’s plays “The Stillborn Lover” and “The Trials of Ezra Pound.” Written by Michael MacLennan, this review is notable since it deals with drama, rather than the novels for which Findley is primarily known.